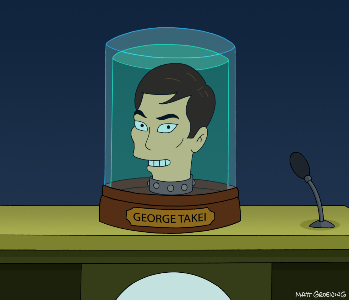 For the second episode in a row, Futurama decided to focus on parodying current events. For obvious reasons, pop-culture has always been in the background of the show, and took center stage only infrequently. That said, while each the previous two episodes had certainly taken on current events, in both cases the references were less recent, yet still enduring. It’s just a different direction for the show to take and it’s rarely led to its best episodes. “Proposition Infinity” begins with Amy and Kiff breaking up after what’s implied to be another fight over her flirting. And really, it’s about time, since that the two don’t make the slightest bit of sense as a couple. The breakup happens incredibly quickly, and while we’re not shown what Kiff spends the episode doing until the very end, Amy falls right into Bender’s arms. The show has long set up that robot-human relationships are at the very least frowned upon, and the pair is harangued by the Planet Express employees before soon being taken away by Amy’s family and Bender’s priest, respectively (well, Bender’s on-again, off-again priest). So here the show’s real commentary kicks in, with the pair’s taboo relationship being a clear parallel to gay relationships. In case it’s not obvious enough, Proposition Infinity is Futurama’s version of California’s Proposition 8 ballot initiative during the 2008 elections, which made gay marriage illegal in the state again. It’s a heavy-handed metaphor, but that didn’t bother me much because while the metaphor was an important part of the episode, it didn’t drag the rest of the show down. Characters still acted like themselves, and the joke-writing was still just as centered on the Futurama universe as it was on contemporary commentary. In fact, I was more annoyed that the episode drops everyone back where we began than about the entire robosexual marriage business. The robosexual plotline led to some truly inspired jokes, such as the minister’s interest in humans and the revelation that Professor Farnsworth was in love with a robot. Kiff and Amy at the end feel just as weird a couple at the end as they did in the beginning, and now they’ve got a motorcycle. There was never any suspense whether or not Amy and Bender would work as a pair, but Kiff and Amy’s relationship seems played out and more odd the more you think about it (i.e. if they’re more or less married why does Kiff spend most of his life across the universe with Brannigan?). It sounds like faint praise to say that this episode is the season’s best thus far, but the difference was that in many ways this was a more by-the-books episode of the show, without any egregiously irritating parts. A standard episode of Futurama is pretty damn good. The characters are so well-defined that things work like clockwork, and “Proposition Infinity” never slows down. Kiff and Amy riding off into the sun was a nice conceptual joke, even if I don’t feel like it was good for the series. I’d like to see them lay off the contemporary commentary episodes for a bit, but other than that it was exactly what any fan of the show would hope for. - Quite dig the Nixon-despair Obamicon. And not just because Paste is all about the Obamicons. - Another great sight gag is the sock stabbing. - Ghost and horse marriages are awesome, I don’t care what anyone says.